LOS ANGELES, CA--(Marketwire - May 1, 2008) - In celebration of the American entrepreneurial spirit and accomplishments of small business owners, each year, the President of the United States designates one week as "National Small Business Week." Serving as vice-chairman of the President's Advisory Council on Financial Literacy, John Hope Bryant addressed participants at the hailed event in New York City on April 25th. Representing the interest of all the men and women who contribute to the nation's fiscal health, the Operation HOPE (HOPE) founder, chairman and CEO's remarks focused on "Achieving 'Silver Rights' Returns on 21st Century Community Reinvestment: Unleashing a New Generation of Young Minority Entrepreneurs Throughout America." "With April being Financial Literacy Month, I'm honored to share HOPE's mission for 'Silver Rights' -- our goal to propagate economic opportunities that exist across this country and beyond," said Bryant. "It's critical that small business owners realize that financial literacy is as much about enriching the spirit as it is about growing net worth and advancing economic standing." Bryant continued, "I started out as an entrepreneur in Compton, California at age 10. I am still an entrepreneur, but today more of a philanthropic entrepreneur, seeking to empower those left behind and to show them how capitalism and free enterprise can work for them, too." The U.S. Small Business Administration (SBA) honored more than 100 small business owners at five major award events. 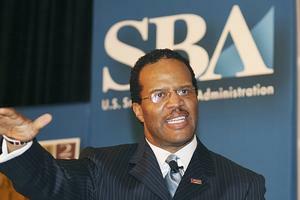 The SBA also promoted its new Web site, http://www.NationalSmallBusinessWeek.com. Visitors to the site will find it richer, deeper, and easier to navigate, with a look and feel that conveys the spirit of excitement surrounding this year's Small Business Week events. The flurry of activity kicked off with scheduled events in both Washington, D.C. (April 21-23), and in New York City (April 24-25). Among the other prominent business leaders, CEOs and politicos who participated are Secretary Mike Leavitt, U.S. Department of Health and Human Services; Ambassador Susan C. Schwab, United States Trade Representative; David Latimore of the Initiative for a Competitive Inner City; and Newt Gingrich, former House Speaker. Operation HOPE (HOPE) is a leading global nonprofit social investment banking and financial literacy empowerment organization. Through various initiatives and its three principal programs: Banking on Our Future (teaching youth about financial empowerment), HOPE Coalition America (financial emergency preparedness and recovery), and the HOPE Center Banking Network (loans, bill pay, computer literacy, understanding banking principles), HOPE is at the forefront of a "Silver Rights Movement," making free enterprise and capitalism relevant to all underserved communities. For more information, visit us at www.operationhope.org.